You are on Summary. Skip to the next section. 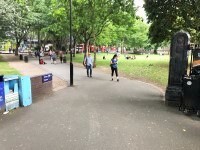 The following information describes the route from the Main Quad to London Euston Station via Gower Street, Gower Place, Gordon Street, Euston Road and Euston Square Gardens. The approximate distance of this route is 500 metres. The route takes approximately 7 minutes. 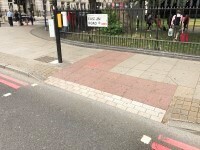 The majority of paths along the route consist of tarmac, block or brick paving with some slight gradients in places. 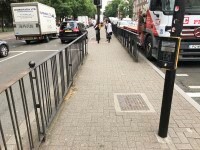 The potential hazards on this route include; busy roads, crossing points (Gordon Street, Euston Road) and congested pathways. The station has level access to all platforms via ramps. Lifts are provided between the concourse, taxi and car park and London Underground ticket hall. 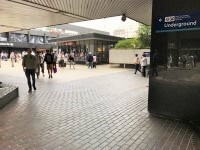 Lift access is available to the underground ticket hall, however the underground station itself has only escalators and stairs. 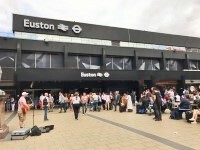 For further information regarding Euston Station please click here . You are on Main Quad. Skip to the next section. 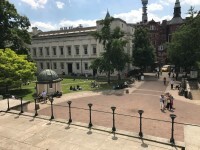 The Main Quad is located off Gower Street. 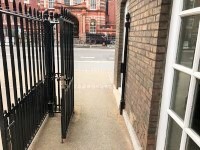 At the entrance/exit of the Main Quad there are two 85cm wide gates for pedestrians (photographs 6 and 7). 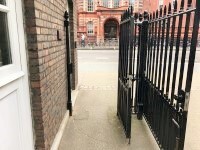 These gates are located on either side of the 330cm wide main gate used by both vehicles and pedestrians (photograph 5). There are also bollards located immediately beyond/before the gates as you enter/exit the Main Quad (photograph 5). 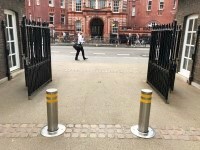 These bollards have gaps between 90cm-120cm wide. 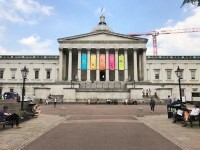 The Chadwick, Pearson, North Wing and Wilkins Buildings can be accessed via the Main Quad. 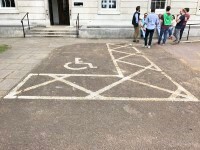 Only the Chadwick, Pearson and Wilkins Building are accessible via external ramps. Please see the relevant access guides for further information regarding access to these buildings. 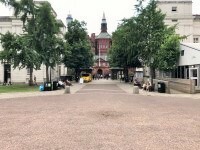 The majority of the Main Quad has a tarmac surface. The tarmac is loose in places. There are easy gradients throughout the Main Quad including on the pedestrian pathways. 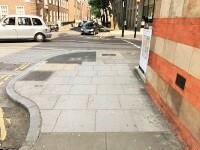 The pathways (photograph 8) consist mostly of block paving and are narrow and uneven in places. 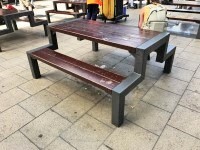 There is ample seating available in the form of wooden benches (photograph 9). These are located along the entirety of the pathways. There are 2 Blue Badge bays available within the quad (photographs 10 and 11). These are located on either side of the main building. 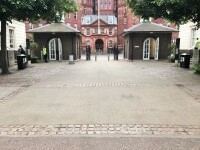 There is an information point located at the front lodge, on the left hand side of the Main Quad entrance/exit gates (photograph 12). 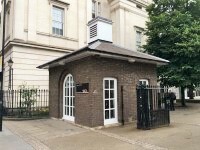 Please see the relevant access guide for further information regarding the front lodge information point. 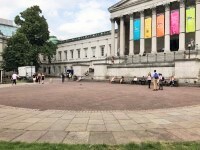 You are on Main Quad to Gower Place Turning. Skip to the next section. 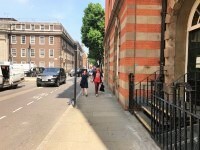 Upon exiting the Quad, turn right and head towards the road crossing approximately 110 metres along Gower Street. 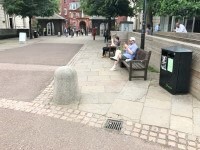 The path along this section of the route consists mostly of tarmac with sections of brick paving and concrete when exiting the quad. 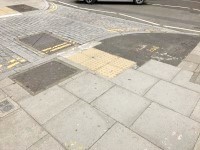 There is also block paving on the approach to the Gower Place turning. The path is mostly level with easy gradients in places. 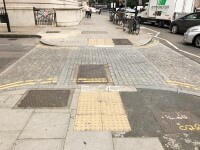 The path is uneven in places due to slightly lowered drain covers. The path narrows in places due to obstructions such as lampposts and transformer boxes. 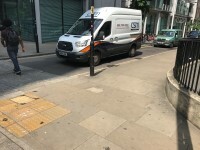 Approximately 40 metres along Gower Street, there is a section of tactile paving across the path (photograph 4). 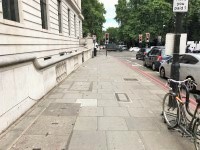 Immediately prior to the Gower Place turning, there is a road sign with 2 metal support poles located in the centre of the path (photographs 7 and 8). The width of the gap between the poles is 90cm. Upon reaching the end of the path, turn right onto Gower Place. You are on Gower Place Turning to Gordon Street. Skip to the next section. Head along Gower Place for approximately 170 metres, towards the Gordon Street crossing. The path along this section of the route consists of block paving. 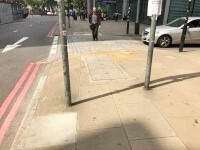 The path is mostly even with the exception of a drain cover at the beginning of the route (photograph 2). 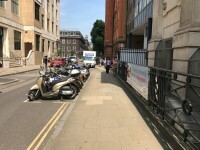 Approximately 130 metres along Gower Place there is a vehicle entrance point into Gower Court. 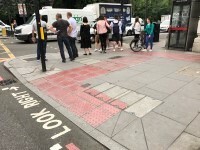 The crossing has tactile paving and dropped kerbs on both sides with moderate gradients between the path and the road. The road surface consists of tarmac that is uneven in places. 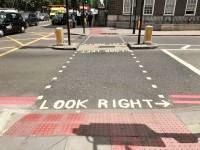 There are no visual signals available at this crossing. When crossing, be wary of vehicles entering/exiting Gower Court. 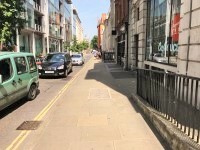 Having crossed, continue along Gower Place for a further 40 metres towards the Gordon Street. You are on Gordon Street to Gordon Street Crossing. Skip to the next section. Upon reaching Gordon Street, turn left onto the Gower Place crossing. 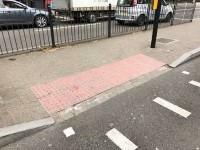 The crossing has tactile paving and dropped kerbs on both sides. There are easy gradients between the path and the road on both sides. The road surface consists of brick paving and is level. 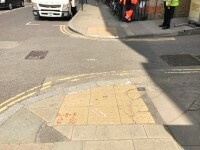 The road is uneven in places due to raised bricks as well as a lowered drain cover at the beginning of the crossing. Having crossed, continue ahead for approximately 40 meters towards the Gordon Street crossing. 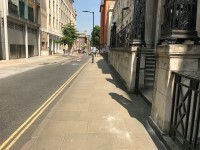 The path along this section of the route consists of block paving and has a slight easy downward gradient along its entirety. 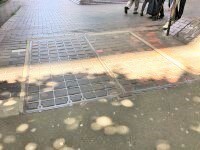 The path is uneven in places due to multiple lowered/raised drain covers (photographs 3 and 4). Having reached the end of the path, turn right onto the Gordon Street crossing. You are on Gordon Street Crossing. Skip to the next section. 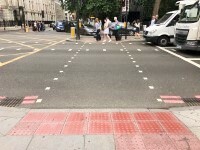 The crossing has tactile paving and dropped kerbs on both sides as well as on the central island (photograph 3). There are moderate gradients between the path and the road on both sides. The road surface is cambered and consists of tarmac. The road is mostly even. 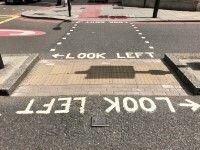 There are visual signals available both at the beginning and middle of the crossing. The visual signals are activated via push buttons. These are between the heights of 95cm and 105cm. 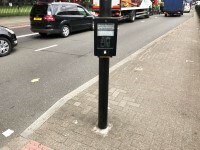 There are rotating cones located at the base of the push button boxes to indicate when it is safe to cross. 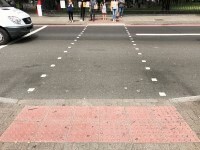 Between the start and the middle of the crossing, the traffic flow is from the right hand side. Between the middle and the end of the crossing, the traffic flow is from the left hand side. 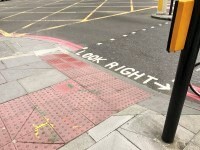 Having crossed, turn slightly left and continue ahead for approximately 5 metres until reaching the Euston Road Crossing. 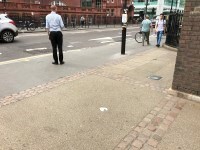 The path at the turning consists of block paving and has tactile paving in places. 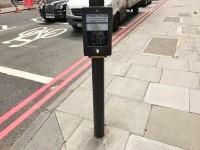 You are on Euston Road Crossing. Skip to the next section. 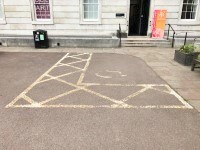 This crossing point consists of two crossings separated by a central island. 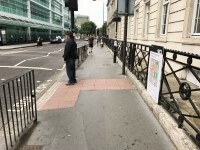 The first crossing (photograph 1) has tactile paving and dropped kerbs on both sides. 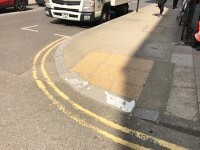 There are easy to moderate gradients between the path and the road on both sides. The surface of the road consists of tarmac. There are visual indicators available at this crossing. Upon reaching the central island (photograph 4), turn right and continue ahead towards the second road crossing. The central island surface consists of brick paving. The central island is level and mostly even. The central island becomes narrow in places (photograph 4). 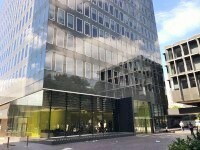 The second road crossing (photograph 5) is similar to the first. 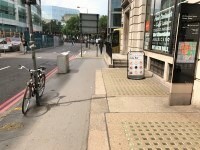 You are on Euston Road Crossing to Euston Square Gardens Ramp. Skip to the next section. 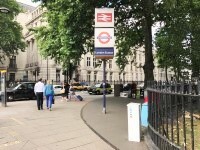 Having traversed the second crossing, turn slightly left and head towards the large Euston Station Sign (photograph 1). 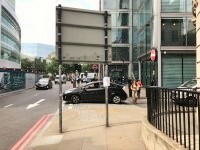 Upon reaching the sign, turn right into Euston Square Gardens. 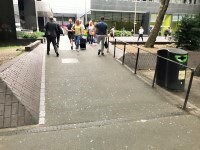 There is signage on the brick wall to the left of the pathway as you enter Euston Square Gardens indicating that this is the accessible route to Euston Station. The path along this section of the route consists of tarmac. The path is mostly even and level with the exception of an initial easy downwards slope. 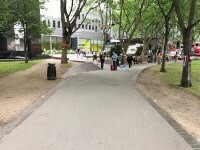 After approximately 50 metres, turn left onto the Euston Square Gardens ramp. (photograph 5). The ramp has an easy gradient with handrails on the right hand side. 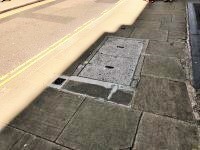 The ramp is mostly even with the exception of the top which is made uneven by a large drain cover (photograph 6). 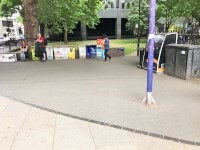 You are on Euston Square Gardens Ramp to Euston Station Approach. Skip to the next section. 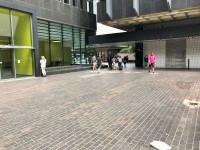 Upon reaching the top of the ramp, turn slightly right and head across the open brick paving area (photographs 1, 2 and 3) towards the One Euston Square Building (photograph 2). 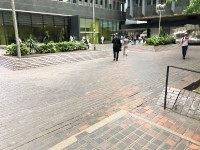 The open brick paving area is mostly level with easy gradients in places. 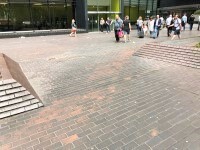 The open brick paving area is uneven in places. 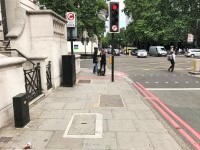 Once in front of the building, turn right and head towards the opening between the Euston Square One Building and Euston Bus Station (photographs 4 and 5). 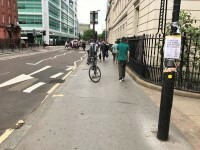 There is signage located along this section of the route providing directions to Euston Station. 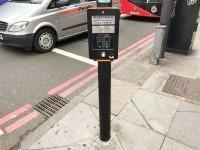 You are on Euston Station Approach to Euston Station. Skip to the next section. 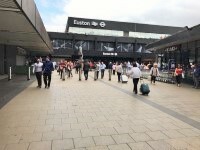 Having come through the opening, turn left onto the Euston Station approach and continue ahead for approximately 40 metres towards Euston Station. The approach surface consists of block paving. The approach is mostly even and level with slight easy gradients in places. 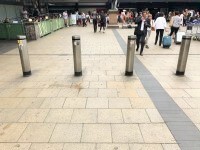 There are bollards, with 110cm wide gaps between them, approximately 20 metres prior to the station entrance (photograph 2). 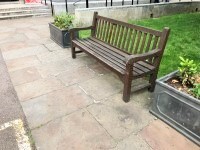 There is bench seating available to the right as you face the station entrance (photograph 3). 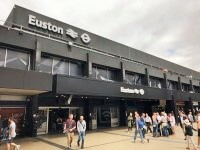 For further information regarding access into Euston Station please see the relevant access guide.